1) Filling a need in the souvenirs market — While living in Doha, Meredith and Lee Hedrick considered starting a business that would offer unique souvenirs and crafts from Qatar. Then Meredith happened to encounter a woman in a coffee shop who was buying eight or nine mugs to ship home to family and friends. “The person who comes up with a good Doha souvenir will become a millionaire,” the woman predicted. Soon after, the Hedricks started Doha Designs. 2) Making diaper changes easier — Grace Welch’s business idea surfaced while she was changing her baby’s diaper. Snapping orders to her sister to bring wipes and other items, Grace struggled to keep the baby from squirming off the small, rectangle changing pad. 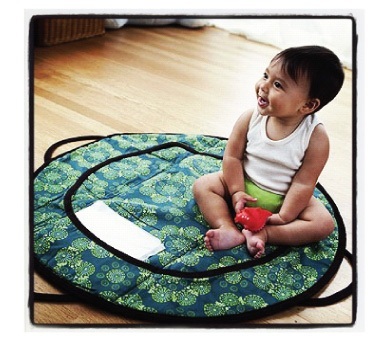 “What they need to do,” she said in exasperation, “is get rid of this crazy pad.” That moment led Grace to design the patemm pad, whose innovative round shape is more accommodating to wriggling infants. 3) Bringing the world a better hotdog – One day, Chris Schutte walked into a Home Depot and saw a product that was almost identical to one he had conceived – but never did anything about. That turning point prompted Chris to start Innovative Everyday Products, whose flagship item is a hotdog bun steamer. 4) Turning rubber bands into a kids craze — Cheong-Choon Ng, a former crash-test engineer for Nissan, found his business idea while watching his two daughters making bracelets from rubber bands. His product is Rainbow Loom, a kit that allows kids to create colorful rubber-band bracelets using a loom and a crochet hook. 5) Finding a new passion from a paper napkin — Jeff Block became interested in origami, the art of making designs out of folded paper, after a friend showed him how to make a rose with a cocktail napkin. One night, Jeff was showing some kids how to twirl a cocktail napkin rose around their fingers when a light bulb went on his head. That moment led to Just Paper Roses, which sells roses made of paper and other wedding anniversary gifts. 6) Jazzing up boring canes — Happy Canes got its start after founder Pearl Malkin (known as “Grandma Pearl”) became bored with her plain black cane. She glued on some flowers – and a new look was born. 7) Putting an end to missing keys – On a rainy night, Linda Nagamine headed to her car parked in a poorly lit area and, once again, couldn’t find her keys in her handbag. She promised herself then and there to invent a solution to her problem. The result was the Joyful Keeper (formerly known as the Cle-a-Porter), which keeps keys close at hand. What about you? Has an aha moment sparked a business idea? Please share your experience below. This entry was posted in Business, Career Changes, Careers, entrepreneurs, Entrepreneurship, Leadership, Retirement, Success and tagged Inventions, startups, Work. Bookmark the permalink. I certainly believe in the concept of “aha moment”. A good market research can validate the market potential of the business idea. Agreed. In some cases, market research will indicate a need to refine the idea. Better to find that out sooner rather than later. Reblogged this on iNSPIRED! . Wow. Thanks, Vincent. I can see why you’re a motivational speaker! The successful business ventures all seem to begin with the aha moment. It’s all about scanning the market and recognizing what people need, even when they don’t realize they need it yet (which is the hard part). Enjoyed this post, intriguing to see how something as commonplace as rubber bands can turn into a business opportunity. In some cases, an aha moment reveals a business idea. In others, it confirms the value of an idea that might have been brewing for a while. Doha Designs is a good example of the latter.